The United States Congress designated the Mt. Wrightson Wilderness (map) in 1984 and it now has a total of 25,141 acres. All of this wilderness is located in Arizona and is managed by the Forest Service. 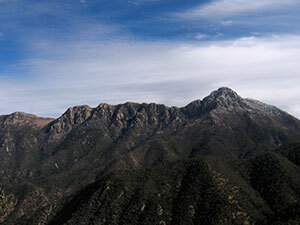 Rising a magnificent 7,000 feet from the desert floor, 9,452-foot-high Mount Wrightson is visible from great distances. At the core of the Santa Rita Mountains, this Wilderness has rough hillsides, deep canyons, and lofty ridges and peaks surrounded on all sides by semiarid hills and sloping grasslands. Ponderosa pine and Douglas-fir dominate the upper elevations. The stream-fed canyons support an abundance of plant and animal life, including many montane Mexican plants that grow nowhere else north of the border. There are also many species seen in few other places in the United States. At the foot of Madera Canyon on the edge of the Wilderness, a developed recreation area serves as a popular jumping-off point for backpackers. Much of this wilderness was affected by a wildfire during the summer of 2005. Trail and spring conditions have changed and current information should be obtained from the local Forest Service office prior to hiking or camping in this area. Planning to Visit the Mt. Wrightson Wilderness? How to follow the seven standard Leave No Trace principles differs in different parts of the country (desert vs. Rocky Mountains). Click on any of the principles listed below to learn more about how they apply in the Mt. Wrightson Wilderness.